22 years, 3 months, 25 days old age. 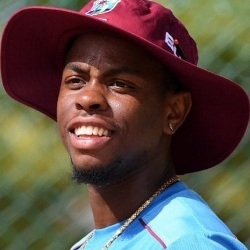 Shimron Hetmyer will turn 23 on 26 December, 2019. Only 8 months, 5 days, 22 hours, 14 minutes has left for his next birthday. Shimron Hetmyer has celebrated the total number of 22 birthdays till date. See the analysis by days count and bar graph. Shimron Hetmyer was born on 26-12-1996 in Cumberland, East Berbice Corentyne, Guyana. He is a Guyanese Cricket Player. Shimron Hetmyer made the headlines after West Indies won the U-19 World Cup in 2016. He was the captain of the side and led his team from the front with some exceptional performance. He aspired to be a cricketer from a very young age and hence started playing cricket from the age of 11. He represented Guyana in all age group cricket. Soon after the U-19 world cup, he was picked by CPL team Guyana Amazon Warriors. He didn’t had a dream start but the following year was handed a test cap. He made his test debut against the touring Pakistan team. He though had a lukewarm start to his career. Late in that year, he made his ODI debut. He though had starts in most of the matches but failed to convert those starts. He got noticed during the West Indies tour of India. Though West Indies lost the series, he was arguably one of the biggest positive for the visiting Windies side. He got noticed and was roped in by RCB at the player auctions. He is going to be Windies biggest asset in the upcoming ICC World Cup 2019. He was born to Gladston Hetmyer and Ingrid Hetmyer. He has an elder brother named Seon Hetmyer and two sisters named Shonette and Shonelle Hetmyer. He has also represented West Indies in the Under-19 World Cup in 2014. He made three ducks in 5 outings in 2014 U-19 World Cup. He is in a relationship with model Nirvani Umrao. His elder brother Seon Hetmyer is also a cricketer. Besides Cricket, he also plays football. He scored the fastest century by a West Indies batsman against England in an ODI match. He scored a century of just 82 balls when England toured West Indies in 2019.